Type and Characteristics - Diesel-electric cutter, one of seven Wind-class, WAG/WAGB-281 (1966), built by Western Pipe & Steel Co., Los Angeles, CA at cost of $9,880,000, laid down 24 August 1942, launched 31 March 1943, commissioned in USCG 18 September 1944, transferred to Russia, back to USCG 22 September 1952, 6,515 tons displacement full load, 269ft long x 63ft beam x 25ft 9in draft, 13.4kts, no armament, helicopter flight deck, 219 crew - 12 officers, 2 warrant officers, 205 men. Log Period and Areas of Service: 1952-88, Eastern seaboard, Arctic, Antarctic, Greenland waters. 31 March 1943 – Commissioned as Icebreaker Westwind (AGB-6) by the USCG at San Pedro, California. 21 February 1945 – Transferred to the Soviet Navy at Seattle, Washington, under the lend-lease program. Renamed in Russian Severny Polyus (North Pole). 19 December 1951 – Returned to the United States at Bremerhaven, Germany, and commissioned as Westwind (AGB-6) by the Navy. 25 February 1952 – Arrived at the Boston Naval Shipyard. 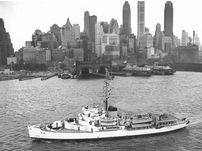 19 March 1952 – Decommissioned by the Navy and transferred to the United States Coast Guard. Westwind (AGB-6) was designated WAGB-281 and AGB-6 was struck from the Navy list on 8 September 1952. 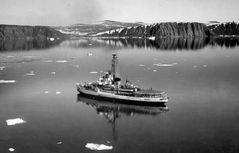 22 September 1952 – Westwind was stationed at Brooklyn, NY and from then on used for icebreaking in the winter and re-supplying Arctic bases in the summer. Summers 1955 and 1956 – Participated in DEW Line construction. 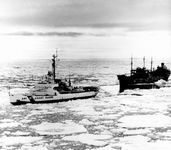 Winter 1957-1958 – Participated in Operation Deep Freeze in the Antarctic. 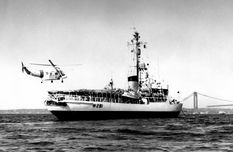 May 1966 – Homeport shifted to Baltimore, Maryland, and continued her routine duties. December 1967 – Participated in Operation Deep Freeze in the Antarctic. March and April 1969 and 1970 - Broke ice on the Great Lakes to extend the navigational season on the lakes. 1972-1973 – Underwent extensive renovation at the Coast Guard Yard at Curtis Bay, MD. 1974 – Stationed at Milwaukee, WI, and used for icebreaking on the Great Lakes through 1981. May to October 1979 – Conducted an Arctic cruise. 1981 – Stationed at Mobile, AL and used for Law Enforcement and icebreaking. 4 October 1983 – Participated in Operation Deep Freeze to the Antarctic. 1 January 1984 – Sustained major hull damage while operating in the Weddel Sea; subsequently returned to the US. 29 February 1988 – Decommissioned. Fate: Decommissioned 29 February 1988, assigned to James River Reserve Fleet. Westwind (AGB-6), with heavy wartime gun armament and a Grumman J2F utility amphibian biplane on her deck amidships.